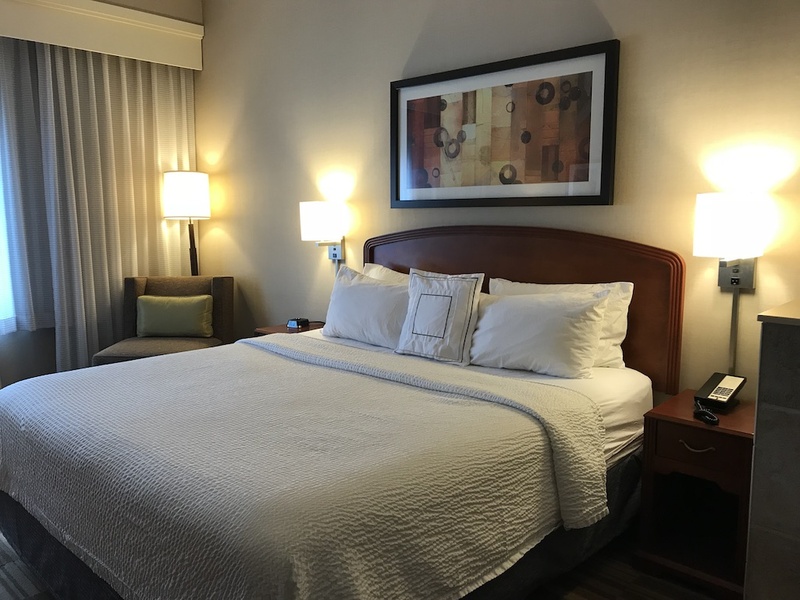 I wrote this post after our media trip that was hosted by Visit Roseville and the Courtyard Minneapolis St. Paul/Roseville. All suggestions and endorsements are solely personal. Our policy is only to share and recommend what we personally like and experience. Many people in the Midwest and around the country visit the Twin Cities, Minneapolis and St. Paul. The area is known for its Midwestern charm and Minnesota nice. Also, it’s loaded with lots of attractions, things to do and many tasty places to eat. What most folks don’t know is that Roseville, Minnesota is located right between those two lovely cities. It’s a bit smaller but its proximity to these two towns is just one reason that makes it the ideal place to stay while visiting the area. 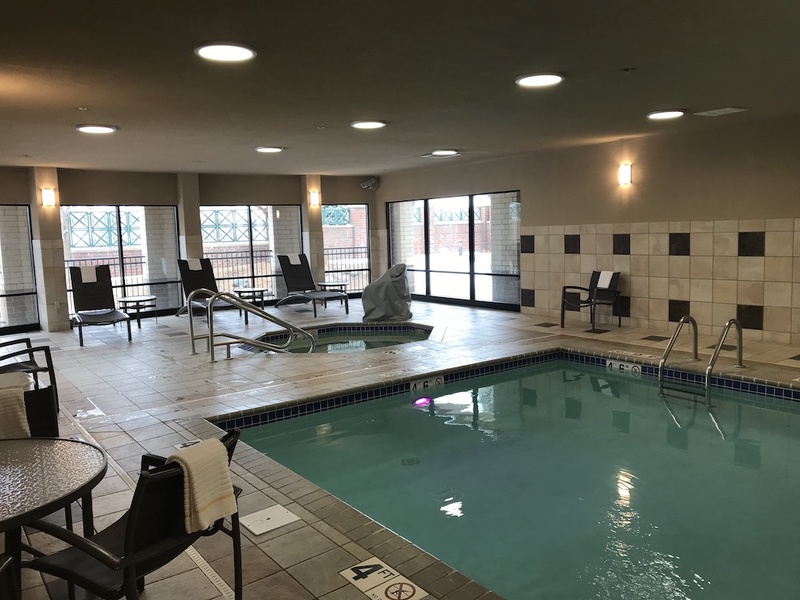 We were lucky enough to be hosted by the Courtyard Minneapolis St. Paul/Roseville on our recent stay. A revitalized property so nice you can almost smell the newness as soon as you walk in. They have a large open lobby and meeting place with a bar for evening cocktails and a bistro for grab and go breakfast and lunch goodies. They have a large screen TV in the public area, which was perfect for enjoying a quick local beer and the NCAA March Madness while we were visiting. 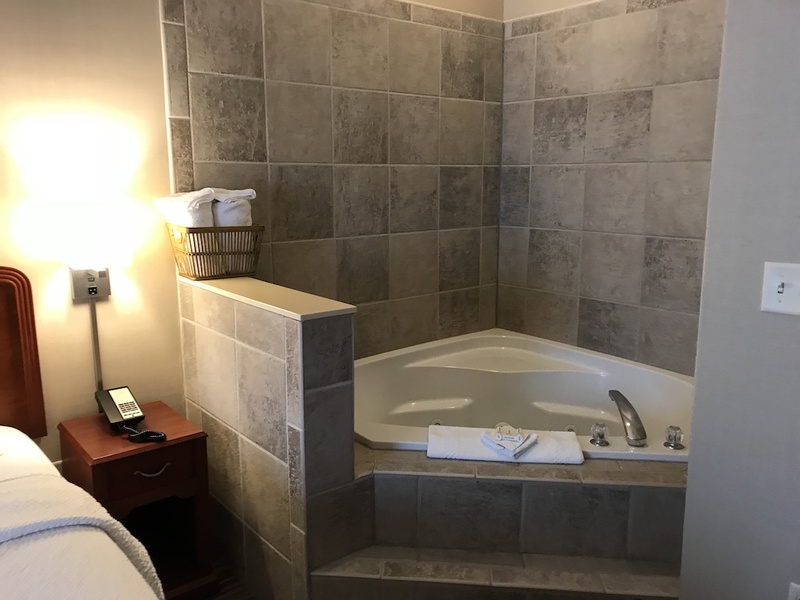 Our spacious room included an in-room whirlpool tub, desk, and ergonomic chair as well as a comfortable king-size bed. We also had free high-speed Internet, HBO, mini-refrigerator, coffee/tea maker and extra comfy chair with ottoman. 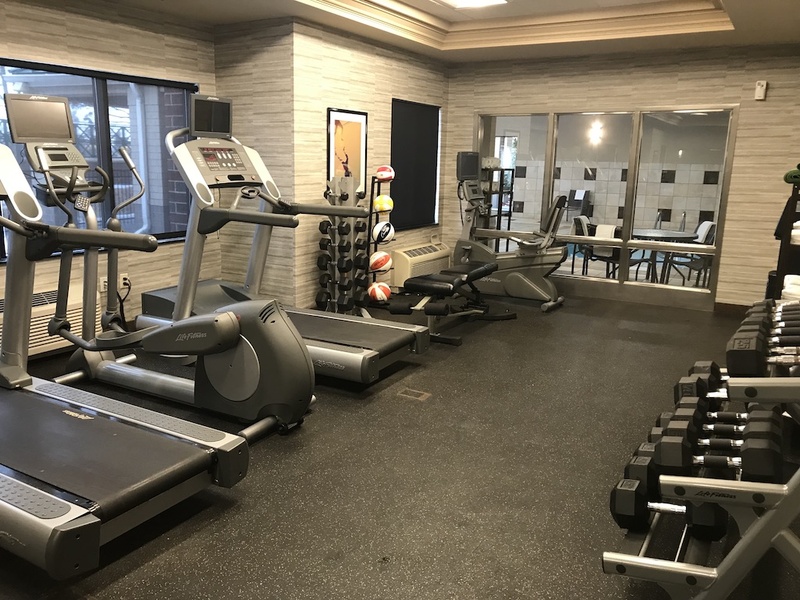 The large gym, indoor pool, and hot tub make sure you won’t miss a workout while you’re traveling. An outdoor lounge area is perfect for relaxing outside or just taking a quick break. 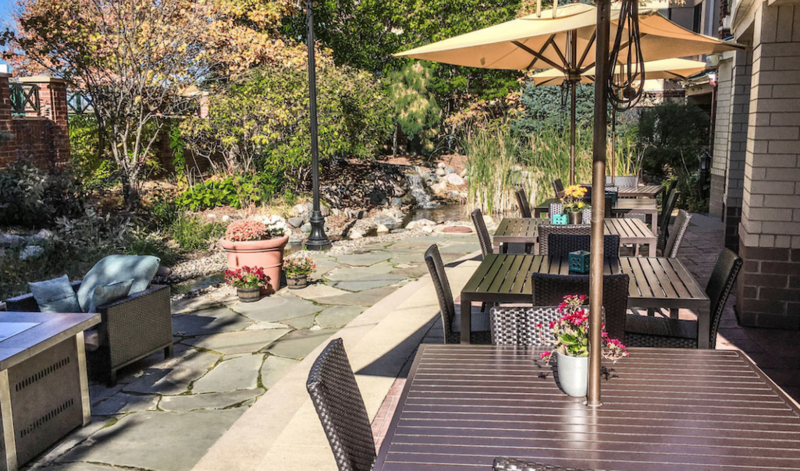 The Courtyard is located conveniently to the expressway for easy off and on to Minneapolis or St. Paul. There are also nearby stores like Aldi (one of our faves) and Walmart both just down the street. 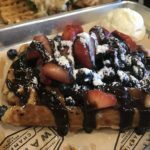 Before you head off to the Twin Cities be sure you add the Roseville food scene to your list too. This is not just a place to lay your head down at night and relax. Roseville has lots of food you’re not going to want to miss. Heading out for a full day you’re going to want to start with a good breakfast. Roseville has you covered. Here are just a few of the tastiest spots to check out. Stop by The Grateful Table for some of the best pastries we’ve ever had (and remember we’ve been to a few places). I’m honestly still dreaming about the almond chocolate croissant we tried there. The mother-daughter team of Mary Robideaux and Christine Robideaux are putting out some amazing food at this small space in Roseville. I spent a few minutes talking to them and really appreciate the importance they put on quality ingredients and hiring the right people. They also have lots of other pastries, quiches, egg dishes, sandwiches and, of course, freshly brewed coffee. For tea lovers like me, you’ll be pleased with their selection of Rishi Teas from the fellow Midwestern Milwaukee company. 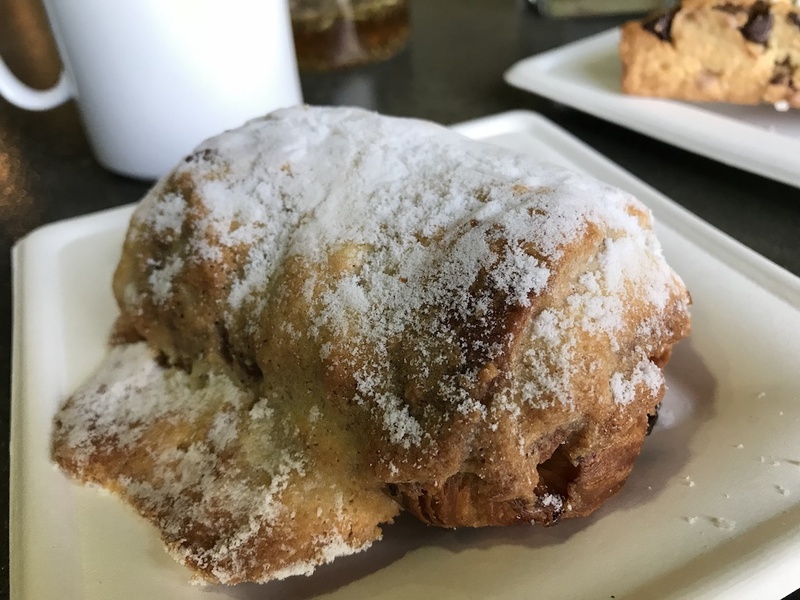 If you want something a little more substantial try Key’s Cafe and Bakery. If you visit on the weekend prepare for a little bit of a wait but know that it’s worth it. Start with their “famous” homemade caramel or cinnamon sticky buns. 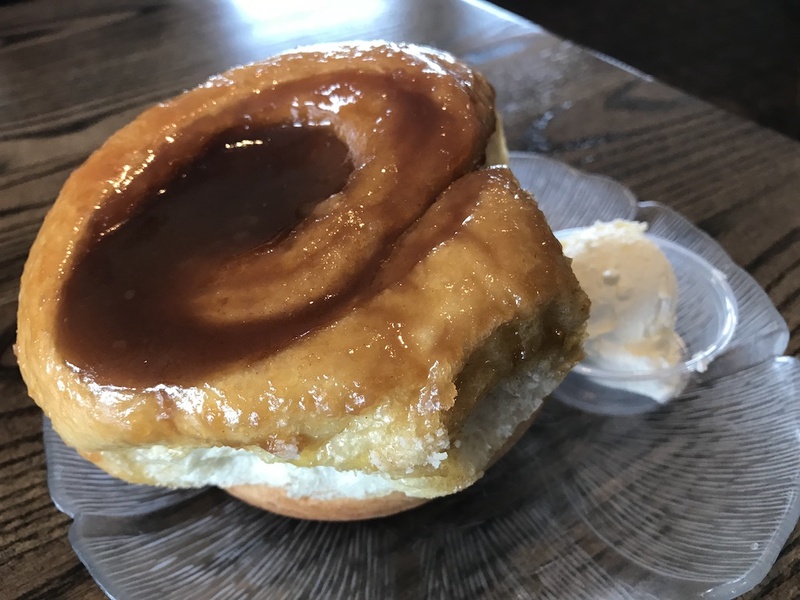 We had to try the caramel bun and it truly lives up to its name. I also had the “Two Guys” Breakfast which was a hearty 7 oz. Certified Angus beef filet with sauteed mushrooms and onions with two eggs, hash browns, and toast. Let’s just say I was set for the day! Diana had the eggs benedict on and giant waffle. Be sure to come to Key’s Cafe hungry and be prepared to leave full. Eating the local seafood is one of the things I love best about traveling. Walleye is a Midwest classic and I always look for on a menu. We were lucky to find the Green Mill Restaurant & Bar a local spot that features many local favorites. 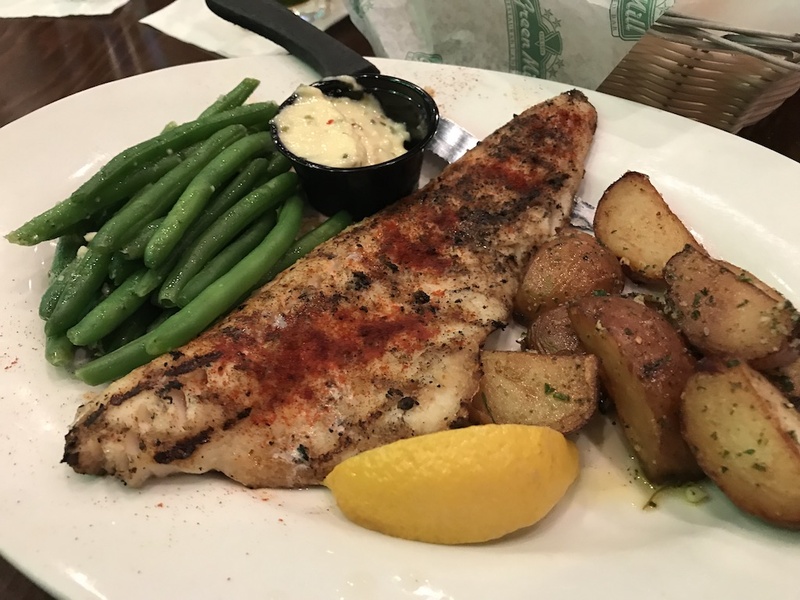 I had my walleye broiled and it was excellent. Get there early because they have happy hour specials on drinks and food. Another hot dish you’re going to want to try in Roseville is, well, Hot Dish. This iconic Minnesota specialty is a casserole topped with crunchy tater tots. Often a stable on many home cooks tables as well as a popular guest at many potlucks. Hot dish has more recipes than you can imagine. Typically loaded with ground beef, cheese, and mixed vegetables but every chef has their own unique concoction. 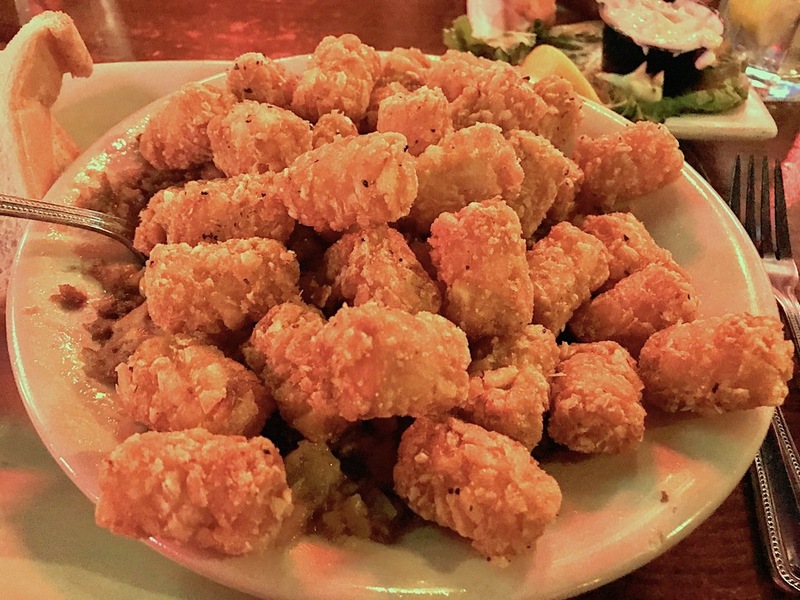 We tried a hot dish at Grumpy’s in Roseville. This is one filling, tasty, cheesy, crunchy dish. Grumpy’s is a family-friendly sports bar with lots of screens, drinks and local beers. Don’t miss the beer battered walleye fingers and Mac’s Big Pizza with its six all beef patties, special sauce, lettuce, cheese, pickles, onions and sesame seeds on a pizza crust. As mentioned, Roseville’s location makes it easy to visit both St. Paul and Minneapolis. Here are just some of the things you’ll want to check out in St. Paul. If you’re looking for fun, cocktails and some tasty food head to Can Can Wonderland in St. Paul. Sure it’s an odd name but who cares? 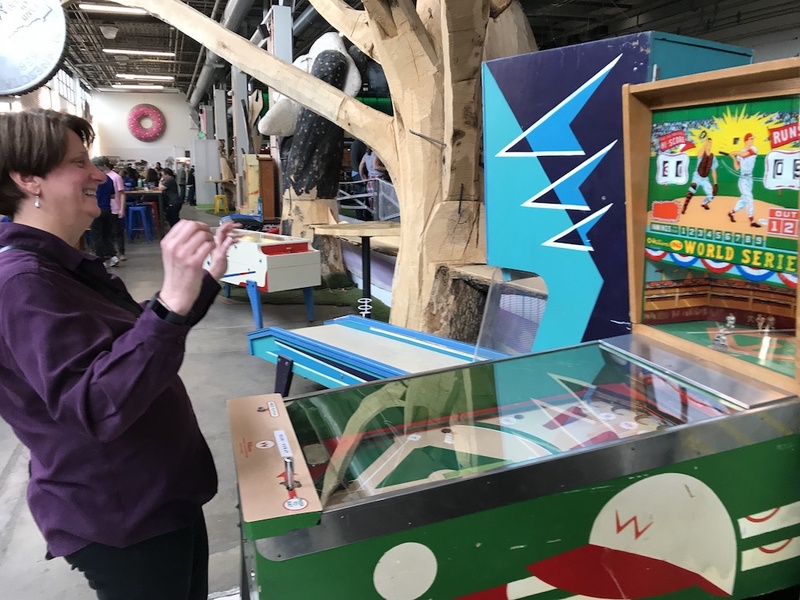 This spot has a kitschy cocktail lounge surrounded by a wild miniature golf course and vintage arcade games. 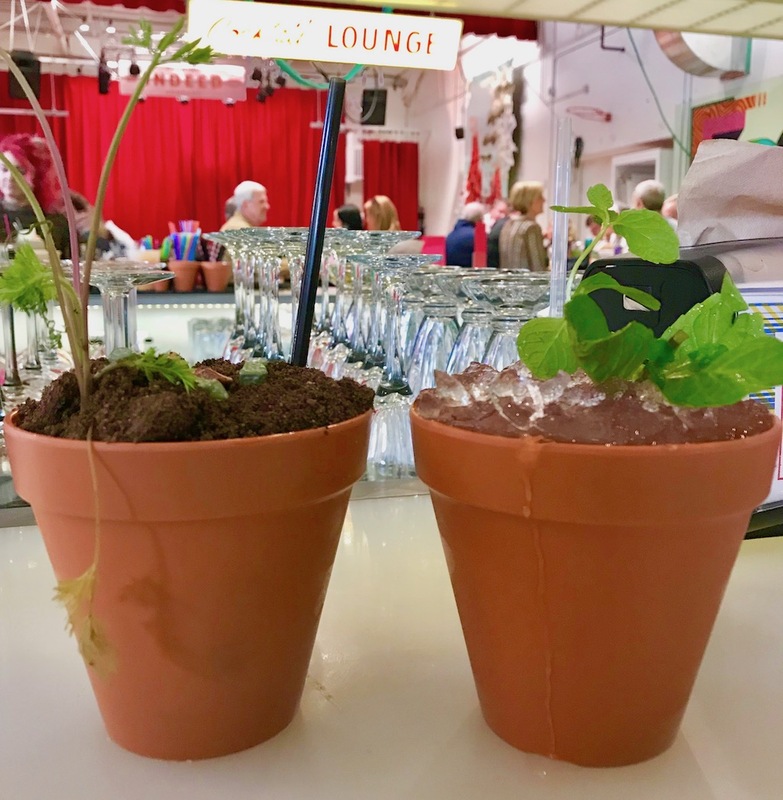 They have super unique cocktails like these two below served in planters. The drink on the left is That Carrot Drink with aquavit sherry, pineapple, carrot, bitters and edible dirt. The greens you see sticking out are attached to the world’s smallest real carrot. The one on the right is the Greenway Garden Punch, which has gin, fruit juices, and herbs and spices. It’s usually served in a watering can but I guess they were out watering when we visited! There are many more fun drinks, boozy slushies, malts, and floats. The food includes bar food classics like nachos, wings, but with a special Can Can twist. Like the Bahn Mi Nachos, Pavarotti sandwich and, of course, cotton candy and popcorn. The bar is a perfect place to hang and have a drink and a nosh while the kids play mini golf and enjoy the games. I have to admit that I was happy to find one of my childhood favorites the World Series baseball game. This old-school game lets you pitch and bat. I will confess to dropping more than just a few quarters into a machine just like this back in the day. It was still just as fun as ever. One of our dear friends Betsy from PassingThru.com who spent years in this area suggested we check out W.A. Frost & Company in St. Paul. Although we were sad we couldn’t meet her for lunch we thoroughly enjoyed our very civilized lunch there one afternoon. From the moment we sat down and heard Vivaldi’s Four Seasons we knew we were in the right place. 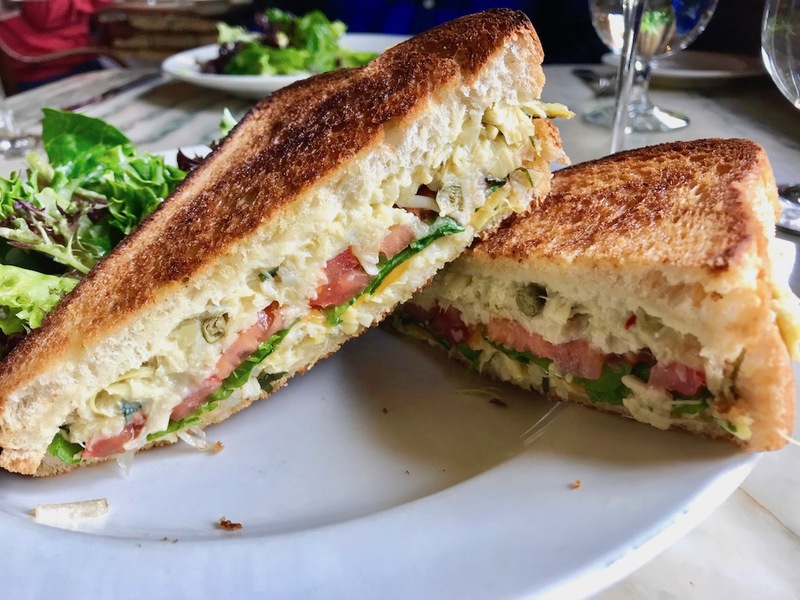 We started with a glass of bubbly and split the artichoke grilled cheese sandwich. Lovely artichokes with cheddar, parmesan, tomato, arugula on Vienna white bread with a fresh green salad. Although the restaurant was a bit empty when we arrived at 11:30 am be sure to make a reservation because it filled up quickly. It’s a perfect location on Cathedral Hill so you can take a quick walk over to the beautiful St. Paul’s Cathedral before dining to work up an appetite. Then head over to W.A. Frost and Company located in the Dacotah Building built in 1889. On the National Register of Historic Places the building originally had fine apartments and a full-service pharmacy. The well-heeled local socialites visited for W.A. Frost for “drugs, chemicals, and medicines, medicinal wines and liquors and fancy toilet articles of great variety.” How fancy! Through the years the building and the neighborhood have seen ups and downs but clearly, W.A. Frost would approve of the award-winning restaurant with fine dining and a large outdoor patio area that we can only assume is bustling during the warmer weather. One more note. I noticed that a lot of diners ordered the grilled Black Angus hamburger. I’m not going to say I had food envy. Let’s just say it looked delicious and I need to go back and try it. The HmongTown Marketplace in St. Paul is a must-visit for all Food Travelists. Minnesota has one of the largest Hmong population in the U.S. The Hmong people became refugees when wars ravaged their homeland in Laos. 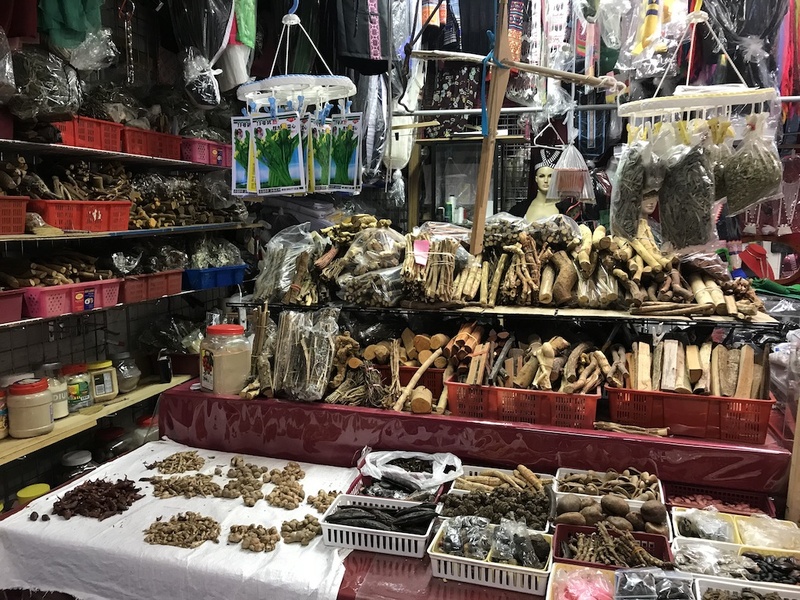 The Hmong Marketplace has over 200 vendors that have fruits, vegetables, fish, meats, spices, clothes, household goods and more. 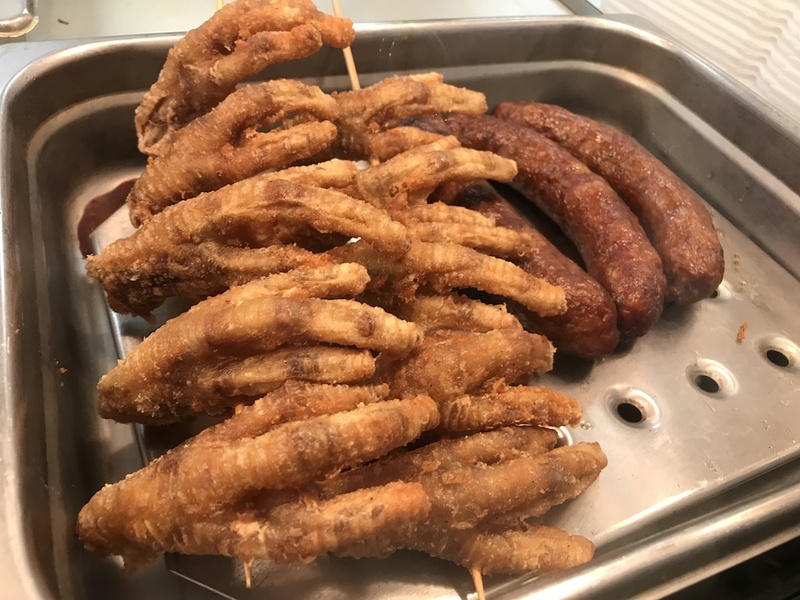 There are also many food vendors making Hmong food specialties. Take some time and explore the kiosks and then enjoy the food too. We would suggest walking all the building first and then making your selections. You will not believe how much there is to choose from. Everything from egg rolls to soup, smoothies, bubble tea, fresh salads and more. They also take great pride in all their dishes. We had a good sampling of the menu and enjoyed it all. 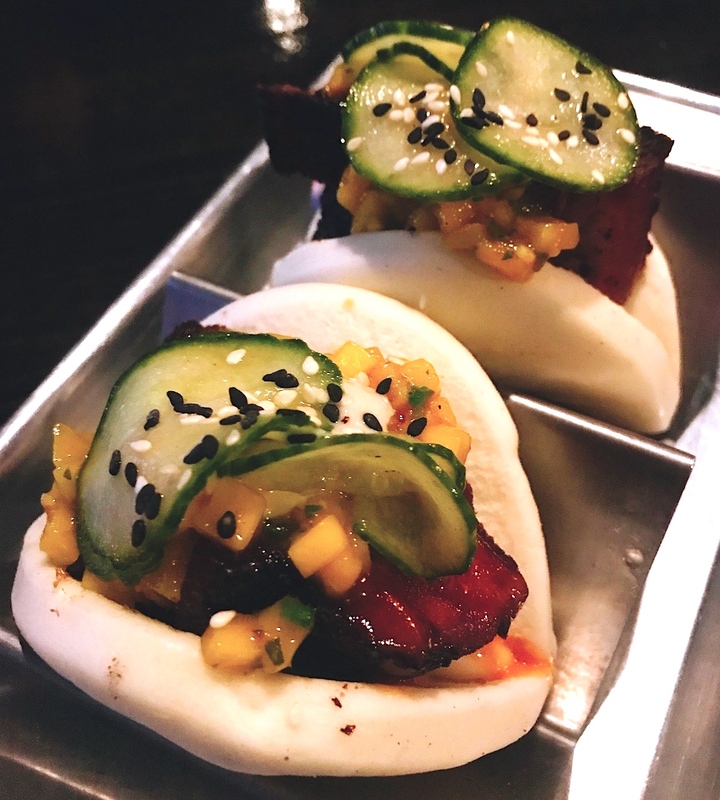 The steamed pork buns with sweet pickles and stone fruit were delicious. It’s a terrific spot for sharing. They have “teasers” which are small bites. Also, small and large plates that make it easy to share and try many different dishes. Let’s take a break from eating for just a few minutes and talk about some of the things you can see in Minneapolis. 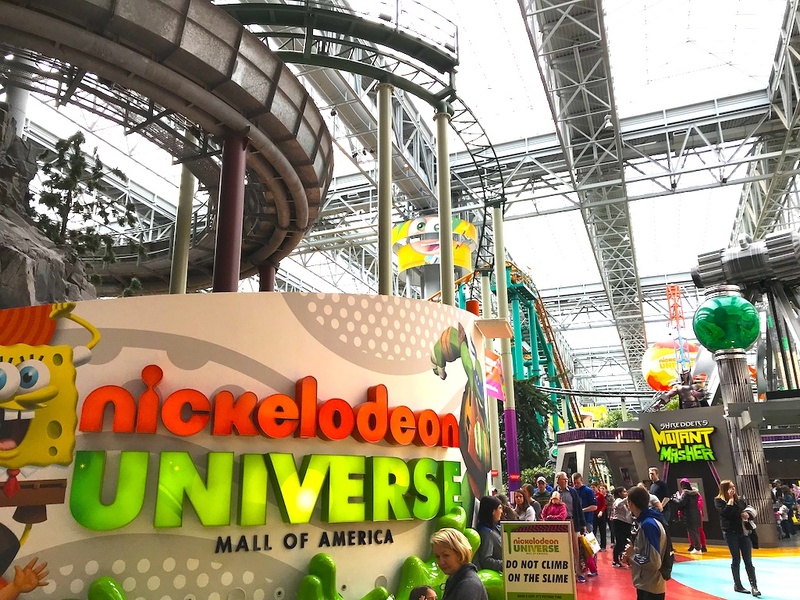 Of course, most people are going to put the Mall of America first on their list of things to do. We’re not big shoppers BUT, as we learned, there is a lot to do there besides shopping. If you like rides the Nickelodeon will spin you every which way you like. When you first enter the large indoor amusement park you are immediately hit with sensory overload. You may even start running around from ride to ride trying to decide which one to try first. There’s also a Lego Store with a huge Lego display. You’ll find characters like the Transformer, white tigers, helicopters and more. 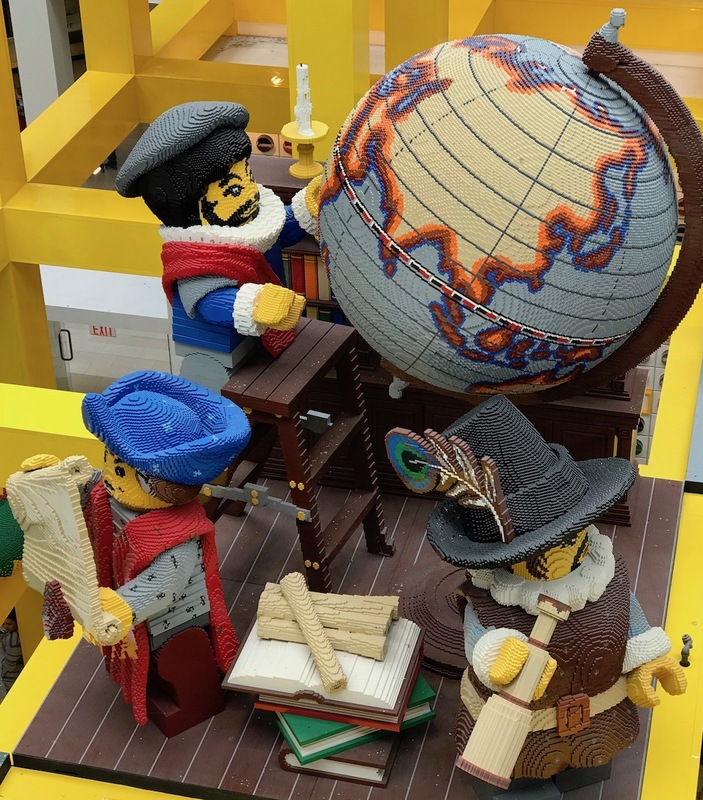 We kinda liked the explorers and globe scene below. You know we’re nature lovers so we had to take a spin through Sea Life in the Mall of America. We had a really interesting chat with one of the guest experience hosts about the stingrays in the Ray Lagoon. These folks are everywhere among the exhibits and happy to answer any questions you may have. 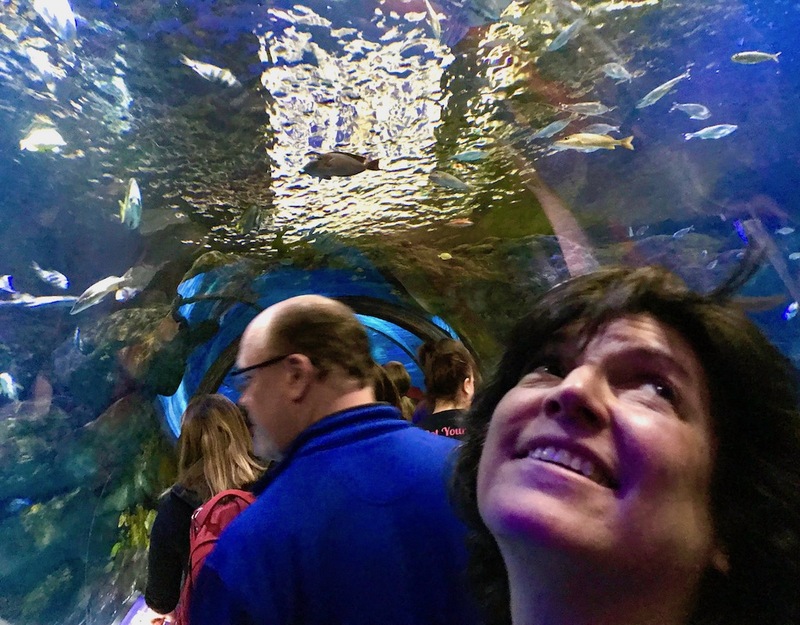 They have many different Sea Life experiences like snorkeling in the Rainbow Reef exhibit, feeding the stingrays, there’s even an opportunity to sleep overnight underneath the sharks in the 300 foot Ocean Tunnel. Sounds like fun! Of course, the Mall of America is a shoppers paradise. 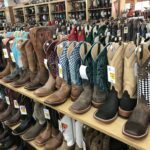 There are over 500 stores with just about everything for everybody. We loved the fun Minnesota shops with novelty gifts and souvenirs. Our favorite was the Animal Lovers Store. 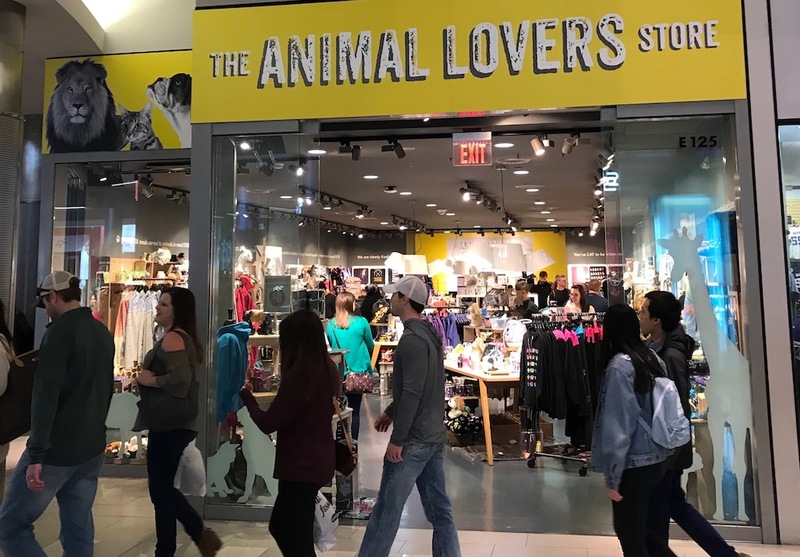 Not only do they have wonderful accessories for your dogs and cats they also have animal-related home goods and clothing. Food is also abundant in the MOA too. 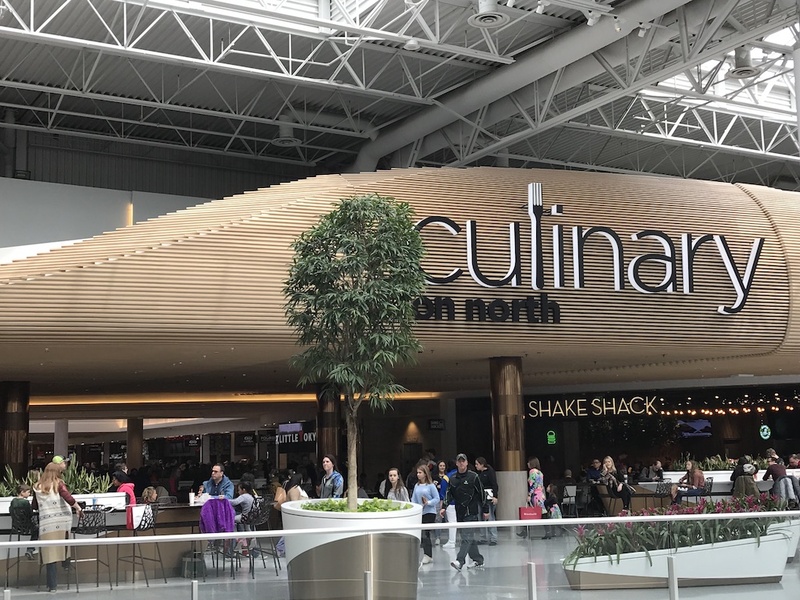 There are several food courts with cuisines from every continent. 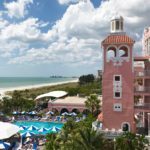 With over 50 restaurants to choose from you’ll find many of your favorites as well as some new ones to try. 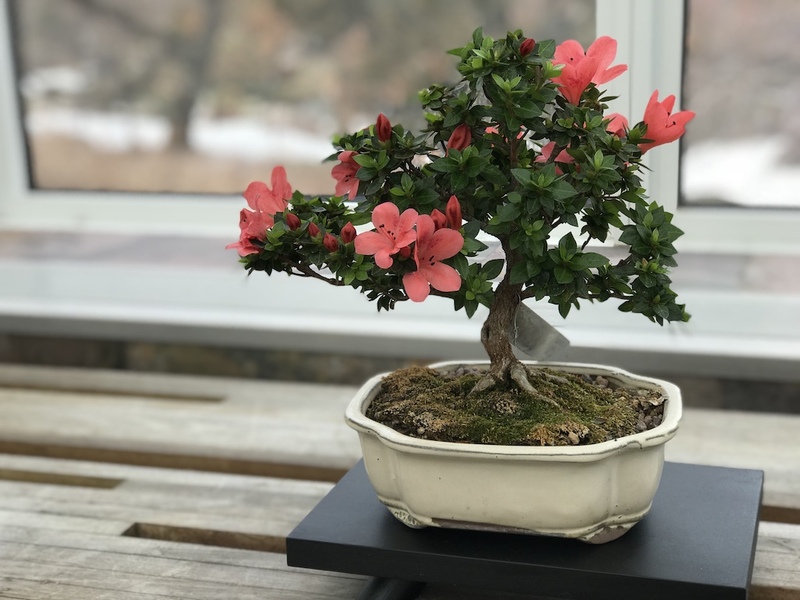 Another fun outdoor activity is the Como Park Zoo and Conservatory. We arrived just in time to see the spring flowers in full display. Walk through all the gardens we really enjoyed the bonsai collection. This place is a photographers heaven. Stroll through the Sunken Garden, Tropical Encounters, Fern Room, Orchid House and more. Admission is free but you can make a voluntary donation of $3 for adults and $2 for children to help run Como Park. You gotta try the local favorites where ever you go, right? 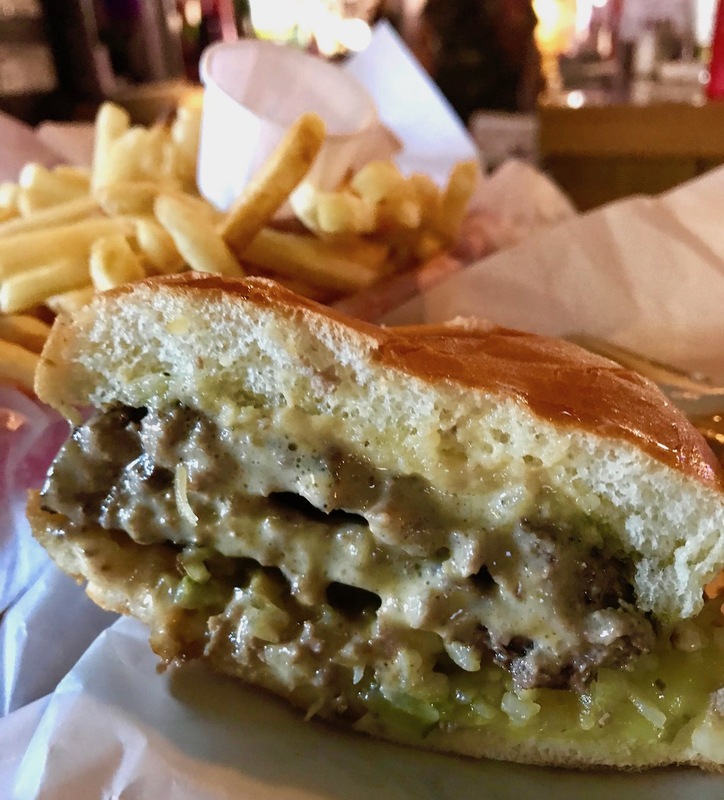 Then don’t miss the Minneapolis Jucy Lucy. Go where the locals go, Matt’s Bar. Yes, you’ll stand in line outside. Yes, you’ll wonder why. Then you’ll get inside the door, smell the grilling onions and burgers and know your wait will be worth it. As they say, it’s often imitated but never duplicated. Be sure you check the spelling because we heard if you spell it right you got the wrong one. Two patties with cheese stuffed in between with grilled onions and pickles. It’s definitely not fancy. But it’s good. Sit at the bar if you can. Here you’ll get to jaw with the staff and see the tiniest grill top in the corner where all the magic happens. Everyone who’s anyone has been here. From President Obama to Andrew Zimmern. So if you go to the Twin Cities and don’t try a Jucy Lucy you’ll have no one to blame but yourself. We know that Minnesota is known for its Scandinavian heritage so we had to visit the Nordic House for a genuine Nordic Waffle. A visit to the Nordic House gives you a wonderful overview of the Minnesota Nordic culture. They have a museum with changing exhibits, classes and a Nordic gift shop. 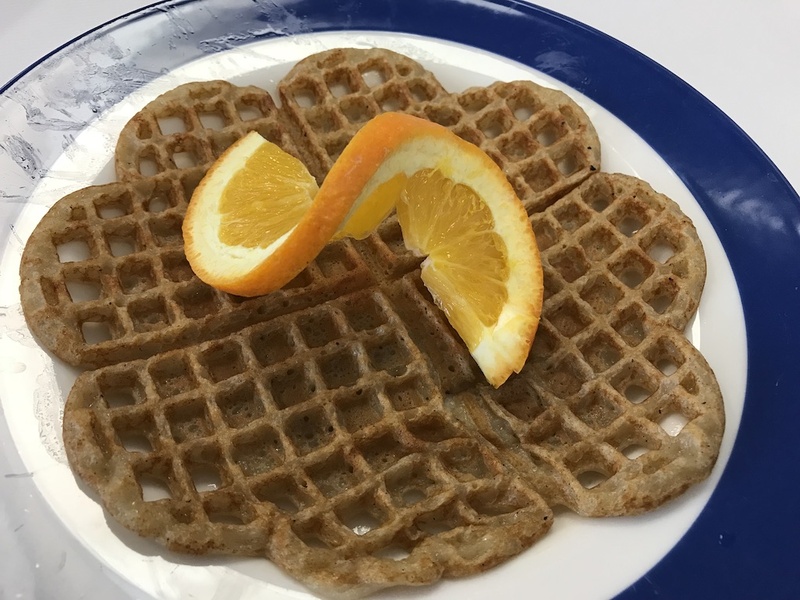 We checked out the KaffeBar where you can sample Nordic waffles and other Nordic pastries as well as coffee and tea. The waffle was served with jam and could be topped with sugar and cinnamon. It’s up to you. We certainly came away with a better understanding of the Nordic culture. No destination visit is complete without a taste of the local ice cream. 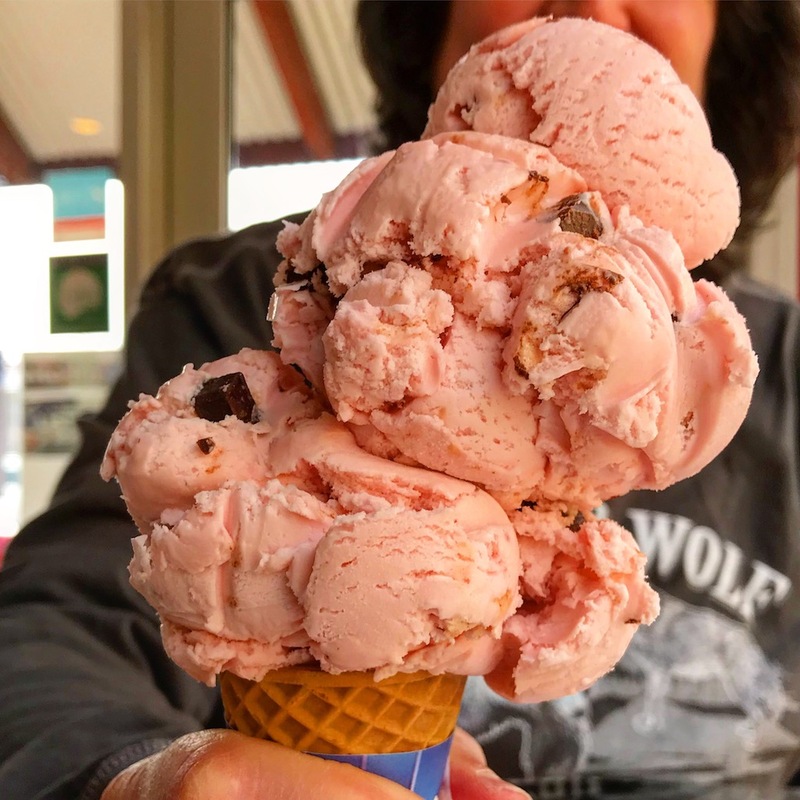 Since we were on a rather short visit and wanted to get to as many tastes as possible we decided to try the Grande Old Creamery for a single cone to split. Little did we know that a “single” cone is more like a triple scoop cone. Since I was raised by a Grandmother who taught me “waste not, want not” we finished the whole thing. For an extra treat be sure to try one of their homemade, hand-rolled malted waffle cones. They make over 200 flavors of their super-premium ice cream so you’re bound to find one right for you. If you’re looking for diner food that really takes it to the next level try Hi-Lo Diner in Minneapolis. We did Sunday Brunch and the hardest thing is picking an item off the menu. Everything looks good and it is. The line on Sunday moves fast and they’ll give you a cup of coffee while you’re waiting. Use this time wisely to pick your brunch items. We tried the Gary Cooper, one of their signature dishes. 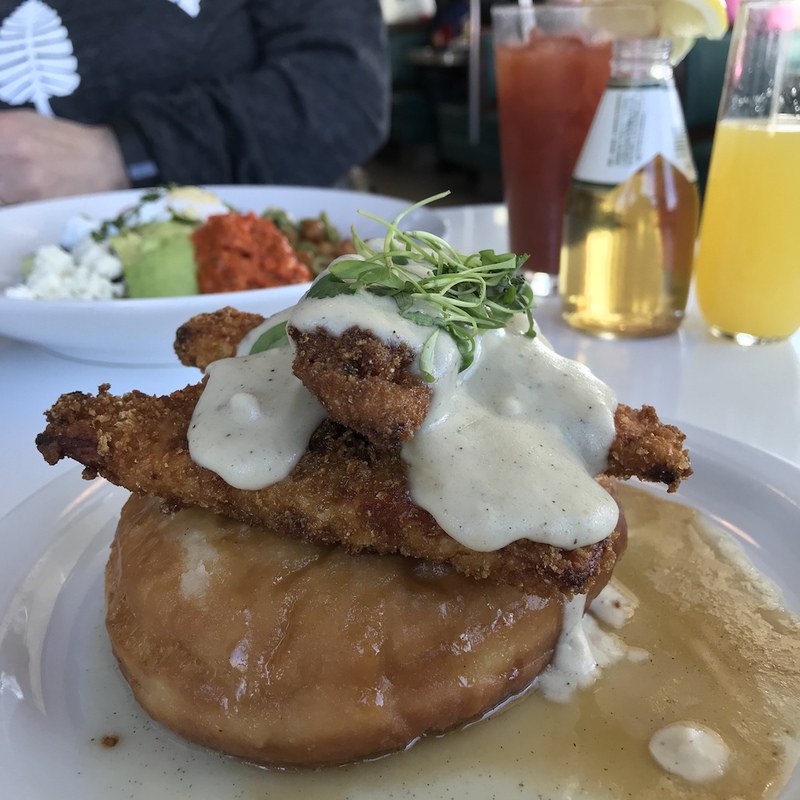 Boneless Buttermilk fried chicken with maple-bourbon syrup and gravy on top of their own fried pastry dough. To say this is decadently delicious is a huge understatement. New to the menu is the flavorful Mediterranean Grain Bowl with romesco sauce, poached egg, avocado, fried chickpeas and feta cheese. I loved this dish! Of course, the Hi-Lo has a full adult Brunch Beverage menu from the Hi-Lo Bloody served with a cute pony-sized Miller High Life to Mimosas, local beers and wine. The Twin Cities local brew scene is also hopping. We tried quite a few in many of the restaurants we visited. 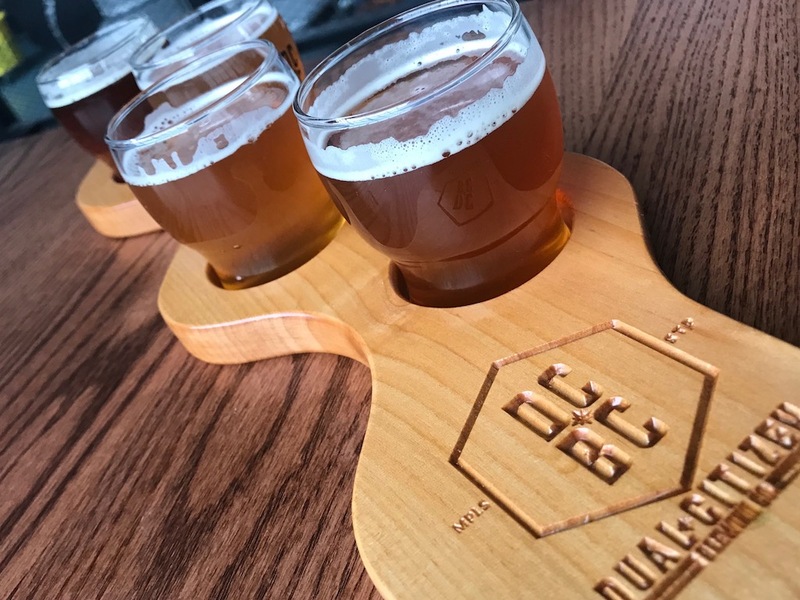 Our travels included a swing by the Dual Citizen Brewery Company for a local flight. What makes this brew tap room particularly fun is that you place your order at the counter take it with you to a table or counter and enjoy. There are no servers, no food, just beer, talking and good times. If you do get hungry there’s usually a food truck parked out front or you can order food from The Naughty Greek (yes, that’s the right name) next door right from your phone. They’ll bring it over and find you. Easy peasy. 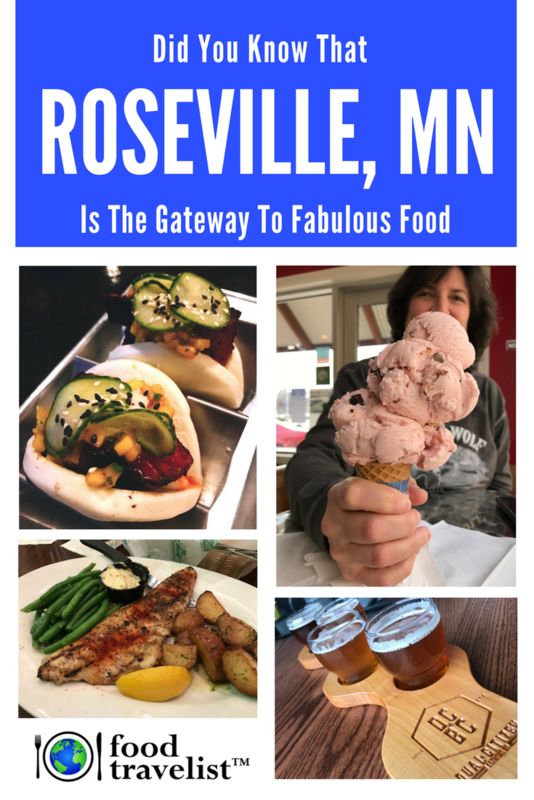 If you’re considering a visit to the Twin Cities area your plans should include staying in Roseville. We’re sure you’ll agree that it’s convenient to both Minneapolis and St. Paul and has a lot going on all by itself. For more information on where to stay, and what to do check out VisitRoseville.com for all the details. Oh wow, this looks like such an amazing place! It’s the first time I’ve heard of this destination but I can see the awesome food trip you guys did. I would personally love to see this place! This looks like such a fun trip. I would definitely want to go and pig out. The waffles look so good and the sticky bun would for sure be my favorite. I need to plan a trip asap! It looks like such a fun trip. But the food is the showstopper for sure! Those waffles look delicious. Food is a big part of our traveling decision making. I have never considered Roseville as a destination. Now, it’s on my travel bucket list, bypassing many other potential destinations. I love the place you chose, Courtyard Minneapolis St. Paul/Roseville. It’s simple but chic :)! So nice! And the food seems to be fabulous for real! Okay that sticky bun is calling my name! HELLO!! 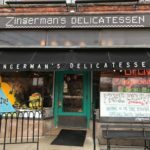 What a great list of places to enjoy some yummy food when traveling in this area. I have never been to Minnesota but I hope to visit one day. Great article. I’m from Minneapolis and agree with everything you said. I’ve been going to Matt’s bar since forever for their famous Jucy Lucy! And yes, Melissa Chapman, Minnesota has the best fresh walleye ever! Wow! So much to do and all the food look fab! They Hmong market looks like a must, I had no idea of the population of people in Minnesota. I can feel a trip coming on for sure! I MUST visit this place! The Hmong market looks so unique and I could learn so much and buy so much! 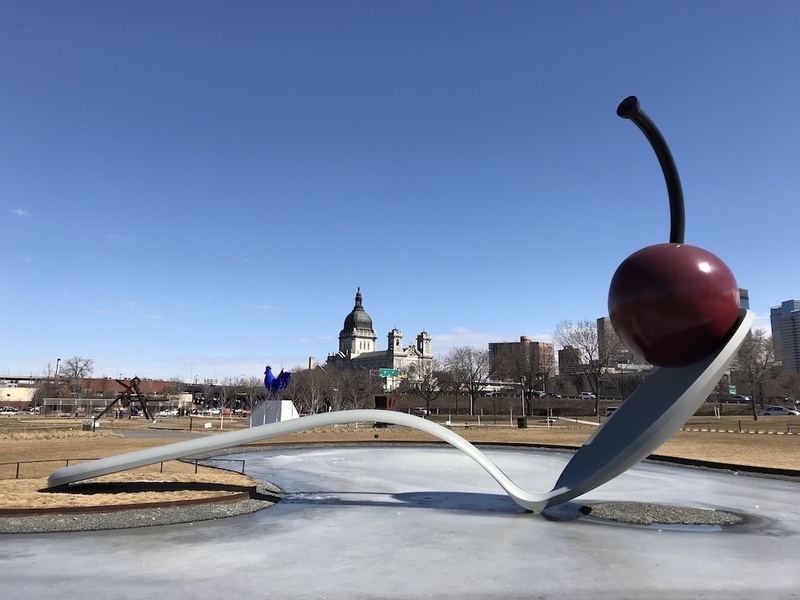 The hotel you stayed at looks cozy and I would love to go to the sculpture park plus that food I mean who does not want to indulge in that!? This post definitely made me hungry! I had no idea how good the food is a around Minneapolis and St. Paul. 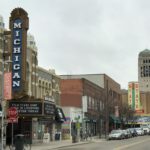 I have family that lives there and I definitely love to visit after reading your article! You had me at all those great places to eat and I don’t think of seafood when I hear Minnesota but it looked so good. The Mall is a must see for me and I have to see that aquarium when I go.